Produced by Jim and Debbie Ziegler, dealers and their managers will leave with a step-by-step "Battle Plan" that will dramatically increase sales and profits immediately. Dealer Principals as usual attend at no charge. In today's fiercely competitive retail environment, every dealership must be operated at maximum efficiency. In today's fiercely competitive retail environment, every dealership must be operating at maximum efficiency. Every profit center must be synergistically integrated with every other department in the dealership while, at the same time, producing their maximum profitability. Your only choices - Grow or Die. The name Jim Ziegler has become synonymous with high sustained dealership profits and super-performance. Ziegler and speakers will demonstrate numerous techniques, word tracts, strategies and real life examples of dealerships that are dominating their competitors with technology-enabled marketing and Internet techniques and programs. This is hands-on, "real-world" stuff, not theory. Ziegler is doing it in the real world, in real dealerships, with real customers. 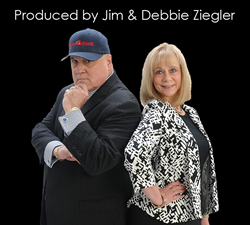 Jim and Debbie Ziegler are legendary in the automobile industry for producing high-quality educational events, conferences and seminars for dealers, managers and manufacturer executives. Hundreds of thousands of dealers, managers and manufacturer executives have attended Jim Ziegler workshops and seminars. Jim and Debbie have produced 18 Internet Battle Plan Conferences and 3 Sales Management Super Conferences attended by thousands with results people in the industry are raving about - and this is Internet Battle Plan number 19 at the beautiful Doubletree Hotel Downtown in Houston, TX. -How to ensure that your dealership doesn't waste a single opportunity to do business. -How to set up and manage a high-volume high-profit BDC. -Methods, programs, marketing and advertising secrets to drive floor traffic and phone traffic. Eric Miltsch, Command Z Automotive Consulting Inc.
And Jim Ziegler, The Alpha Dawg, will be on stage presenting "The Insane World of Alpha Dawg Social Media – Live Examples and Techniques." As always, Dealer Principals, Manufacturer Executives and Association Executives attend at no charge, regardless of whether they bring their managers. Internet Battle Plan XIX is proudly sponsored by AutoBytel, AutoLoop, Cardinale Group, DealerDefender, DealerOn, DealerSynergy, Herman Advertising, iDrive Media, iM@cs, Pineapple Advertising, Remora, SEMD, and TrueCar. For more information, and to register for the conference and book the hotel, visit http://www.internetbattleplan.com, or call Jim Ziegler directly at 1-800-726-0510.